In this extraordinary story of World War Two, the author's father describes the experiences that would affect the course of his life. Douglas Valentine tells of his capture by the Japanese in the fetid jungles of New Guinea, as well as his internment with Australian and British prisoners-of-war in the Hotel Tacloban - a place qwhere no mercy was shown or expected, and from which few came home alive. A celebration of cameraderie and a testament to "the soldier's faith," this is a story of murder, mutiny and an incredible military cover-up. In the summer of 1985, Elmer Voss told me that he, 1st Sergeant Gerald Wolpmers, and another sergeant named Moffit then living in St. Joseph, Missouri were part of the rescue team led by Captain Lintz that liberated my father from The Hotel Tacloban. Voss gave me Wolpmers' address in Amazonia, Missouri and I called him right away. Wolpmers was distressed and said he was going to see "a full fledged colonel in Missouri" who was in charge of the mission. Wolpmers never called back but he did tell Voss to retract his statement. 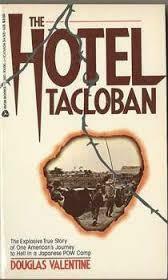 In the 26 September 1984 Christian Science Monitor, reviewer Thomas D'Evelyn said, "After the dust settles, The Hotel Tacloban will be there, bearing witness to man's inhumanity to man, to the impotence of pain, and to the durability of the love of father and son. It sheds light on these dark times. Read it." Letter from Ft. Hood curator Rudeford Norman confirming the existence of the prison camp. The initial reviews were great. Critic Paul Bach called it "A soldier's fascinating story of wartime survival and betrayal...a shocking denouement." James Kaufman at the LA Times called it "A very true book and a story well told, chilling in its accumulation." As I mentioned, there has been steady interest in Hollywood. But the powers that be, in industry and government, can kill any book, especially one that reveals their crimes. The closest I ever got to "official" confirmation (apart from Elmer Voss's personal testimony) was the letter above from the curator at Ft. Hood, Rudeford Norman. Princeton University president Robert Goheen, who had been on General MacArthur's intelligence staff in October 1944, also confirmed the rescue operation. But as my father and I learned the hard way, the only truth is official truth, even when the official truth is a Big Lie.